True to form for Park, Stoker is both visually stunning and psychologically and physically brutal. The cinematography is painterly and the framing sculptural. Every frame merits notice and every still a work of art. In fact it’s safe to say that Stoker is Park’s most strictly art-produced film. Every color and detail bears evidence of obsessive attention, from the color of characters’ hair to the color of the walls, from the stitching on a collar to the scuffing on a shoe. In large part this magnification of detail effectively reflects the psychological and somatic experience of India Stoker (Wasikowska), whose hypersensitive observations of the world make ordinary life an ordeal for her. On the day India turns eighteen her father Richard dies in a horrific accident. We see her first at his funeral. Relations between her parents have evidently been strained for some time. Her mother, Evelyn Stoker, seems hardly bereaved, nor does she attempt to comfort her shattered daughter. If director Park Chan-Wook never did another movie besides Oldboy, he would still be regarded as a masterful filmmaker. Oldboy is just that good. Fortunately, he isn’t resting on the laurels of that excellent movie. He’s doing more. In fact, he’s about to make his English language debut. Sounds cool. Let’s just hope nothing happens to anyone’s tounge in this one. We’re not sure we could go through that again. 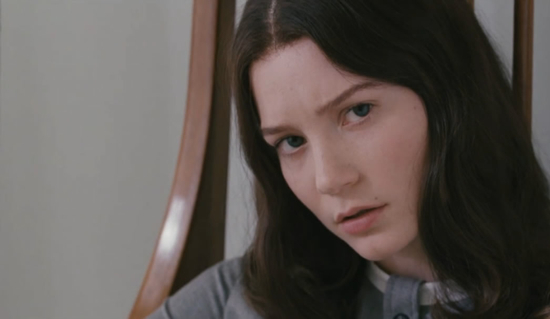 Check out the trailer for Stoker after the break. The casting has not come particularly quick or easy for the Spike Lee directed remake of the Korean thriller Oldboy. Josh Brolin (No Country For Old Men, Men In Black III) locked in as the lead character quite early in the process but the quest for a villain so far has involved names ranging from Christian Bale to Clive Owen, with even Colin Firth being in the mix. All have passed for various reasons and the search continues. Filling the role of Brolin’s love interest, Marie, has been an equally difficult task. Both Rooney Mara and Mia Wasikowska have been offered and rejected the part of the female lead role. It is now being reported that the role of Marie has been offered to Elizabeth Olsen. The film follows an average man who is kidnapped and imprisoned in a shabby cell for 15 years without explanation. He then is released, equipped with money, a cellphone and expensive clothes. As he strives to explain his imprisonment and get his revenge, he soon finds out that his kidnapper has a greater plan for him and is set onto a path of pain and suffering in an attempt to uncover the motive of his mysterious tormentor. The lesser known Olsen sister, Elizabeth seemingly sprang out of nowhere at Sundance 2011 to become one of America’s most sought after young actresses thanks to parts in the soon to be released Silent House and the under the radar film Martha Marcy May Marlene. With three other projects listed to start in 2013, she’s not going away anytime soon. She’s also got a sizable gap in her schedule before those projects are due to start, which makes this a very plausible option. The Kids Are All Right opens with shots of 18-year-old Joni (a wonderful Mia Wasikowska) playing scrabble with friends and 15-year-old Laser (Josh Hutcherson) sniffing a crushed Sudafed with his skateboarding buddy Clay, all to Vampire Weekend’s “Cousins.” Joni and Laser are gorgeous, smart and nice. Despite the minor drug use and usual teenager angsts, they are, for the most part, very much all right. But this movie is really about their parents—their mother Nic, a perfectionist, workaholic OB-Gyn (played by Annette Bening, who has made a career specialty out of wound-tight women), and their other mother, easy-going, nurturing earth girl Jules (a very fine Julianne Moore), who has maybe let her life slide past her. A long-married couple, Nic and Jules have, as parents do, put their kids first for so long that they have lost touch with themselves and each other. Untended Joni and Laser certainly are not. Nic and Jules are extremely conscientious parents, and a great deal of the humor in the early part of this film comes from the overmothering Joni and Laser endure. Nevertheless, Laser feels the lack of a male role model and it is at his urging that Joni, having recently turned eighteen, the age at which she can legally request contact, learns the identity of their sperm donor and gets in touch with him. The sperm donor is Paul, played by the miraculous Mark Ruffalo, who can shade a dozen layers of feeling and thought into a single moment. I’ve sometimes found that his extraordinary openness can come off as ambivalence, but his characterization of Paul is founded on a bedrock of emotion. Paul is not only open to contact with Joni and Laser, he welcomes it. Sure, all the news and focus of the internet, right now, is on the new Iron Man 2 trailer which, in my opinion deserves the amount of excitement that it’s inspired. But, that’s not what we’re talking about now. The new trailer for Tim Burton’s Alice in Wonderland, is online and gives us a pretty thorough, and spectacular glimpse into Burton’s creation of Wonderland. We see the White Rabbit, the Red Queen and her main man, The Knave of Hearts, and yes, the Mad Hatter. It looks fantastical, and certainly Burton inspired, if still in that candy-coated look that he’s had on previous film Charlie and the Chocolate Factory. The film’s synopsis reads as, “19 year-old Alice, returns to the whimsical world she first encountered as a young girl, embarks on a fantastical journey to find her true destiny and end the Red Queen’s reign of terror.” And the trailer gives us glimpses of the Jabberwock, the Mad Hatter’s companions the Dormouse and the March Hare; as well as the Cheshire Cat, and Tweedledee and Tweedledum. The film features Johnny Depp, Anne Hathaway, Helena Bonham Carter, Stephen Fry, Alan Rickman, and Mia Wasikowska as Alice, along with a multitude of others. It’s scheduled for release March 10, 2010, in 3-D and IMAX. There is lots to be said about what we’ve seen from Tim Burton’s upcoming reimagining of Alice in Wonderland, and most of it is about Johnny Depp’s performance as the Mad Hatter. While that will be a definite selling point for the film, there are still many things that it has to offer, such as the distribution in Disney 3D and IMAX 3D. The rest of the cast fills out quite nicely, with Anne Hatheway, Helena Bonham Carter (Burton’s wife), Crispin Glover, and Mia Wasikowska joining the cast. Expect this to be about as twisted as the way Lewis Carroll originally imagined it. The film hits theaters in 3D and IMAX on March 5th, 2010, but you can check out the brand new poster that has hit the web, along with an invitation to join The Disloyal Subjects of the Mad Hatter on Facebook. From there, you can become a fan to get major updates on the film and goodies for you to download. Otherwise, keep it here as we bring you new stuff on Alice In Wonderland in the future, and check out the first full poster for the film after the jump.